This article appeared in the Summer 2008 issue of Texoma Living!. 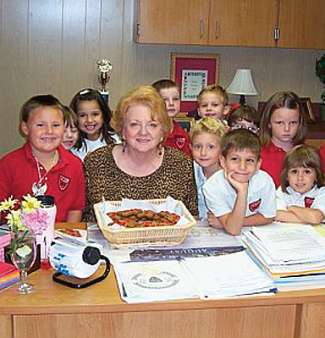 Penny Raines is remembered by friends and coworkers at Texoma Christian School as someone with a charming sense of humor who always kept things in perspective. Her children and grandchildren were the most important things in her life. “Her faith in God was the foundation in her life. She was a great friend, confidante, and mentor. She had so much to do with who I am today,” friend and co-worker Debbie Walston said. Jeff Burley, the Head of School at TCS, remembered Penny. “She was a pillar for our lower school for so long. She had great relationships with the students, parents and staff members, and she provided a sense of stability. Penny went well beyond her job description to ensure the students were served well. It’s about meat, or MEAT in the vernacular of the hungry summer grill master. Brisket smoking long and slow, pork chops, really thick pork chops, and of course, steaks—ribeyes, T-bones, the regal porterhouse—all with a char and a sizzle and juice that runs pink and warm when your knife slides through the beef. Got the picture?